So I’m kind of into headbands at the moment. I used to love to style my hair in braids around this time of year (when it gets warm and windy! ), but after chopping a lot of my hair off last fall, most of my favorite braided styles are beyond me right now. Headbands are kind of filling that hole and keeping things interesting. I mean, I can basically roll out of bed with messy hair, stick a colorful headband on and make everything look intentional. 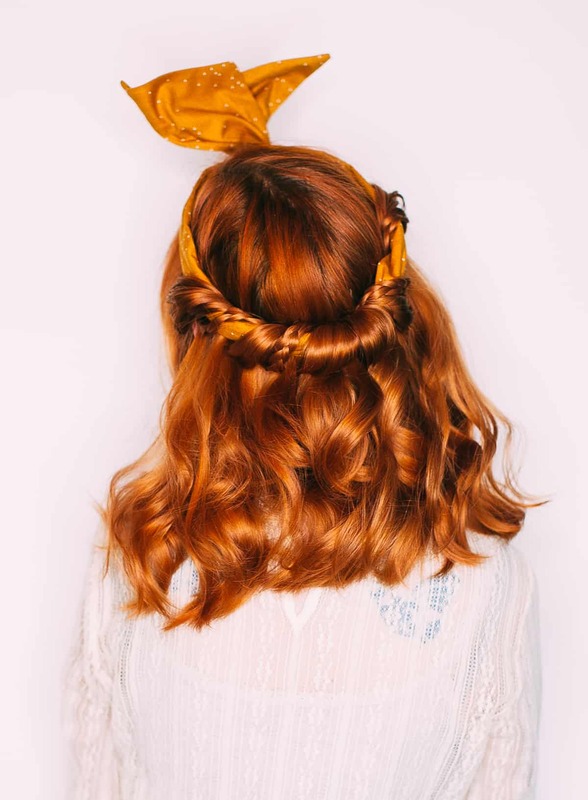 They look chic with your hair down, or a bit of flair around a ponytail, but if you’re interested in a few more interesting styles that can be styled in no time at all, then maybe these easy tutorials will get your creative headband juices flowing! This is a super easy bouffant style that doesn’t call for any teasing. Start with brushed hair and separate a small section of hair on top of your head. Tie that off with an elastic. Take the small ponytail and roll it under, and then tuck that up under your elastic; this will push the top of your hair up into a bouffant. Move the hair around a bit to get it even and to sit the way you want, and then use a few bobby pins to keep everything in place. So easy and perfect when you want to channel that Brigitte Bardot look for summer without the pain of teasing! You can find a more detailed tutorial for this no-tease bouffant here. This is a simple style that I come back to again and again. Start by placing your headband on top of your hair. Use a few bobby pins towards the front of your face to hold your headband in place if it is sliding around too much! Take a small section of hair, pull it up over the headband and then down and through the headband—you’re basically looping your hair around the headband. Keep taking small sections of hair and looping them around the headband. Add a few bobby pins inserted horizontally to keep everything in place. That’s it! This is definitely my favorite style. I wear my hair like this at night to give me a little natural curl and bounce in the morning. It’s also a great style to keep you cool on a hot summer’s day. 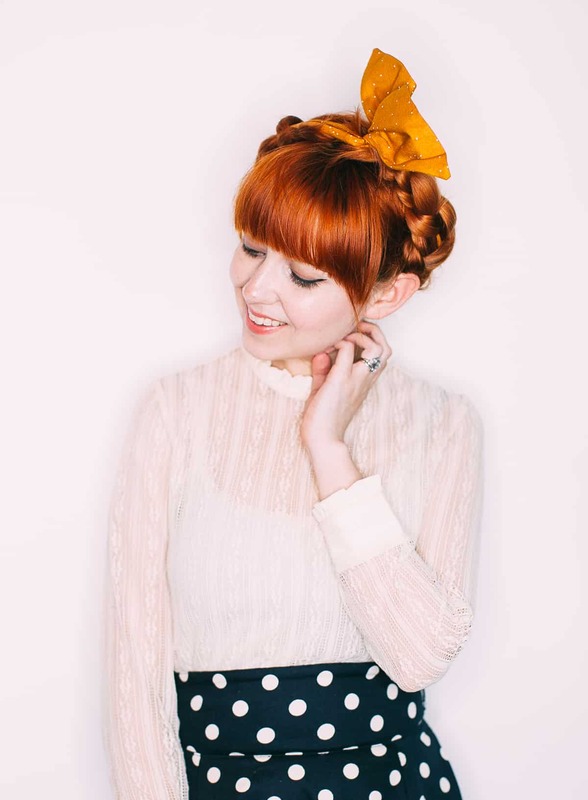 These are seriously the easiest milkmaid braids ever! Start by dividing your hair into two even sections. Lay the headband across your shoulders so that it is even on both sides. Braid one side of your hair, including the headband in one of the sections of your braid. Tie it off with a small elastic. Repeat on the other side so you have two braids with your headband woven through both. Pull the braids to the top of your hair and twist the headband together to hold the braids in place. That’s it! Easier than even the usual milkmaid braids style—I don’t even need any bobby pins to make this style last all day. This is really just a bit of a dressed up take on those super popular “fun buns” everyone seems to be styling these days. Start by dividing your hair into two sections and tie each section off in a high pigtail. For a full bun, tease your pigtails a bit, and then loop them around and pin in place. 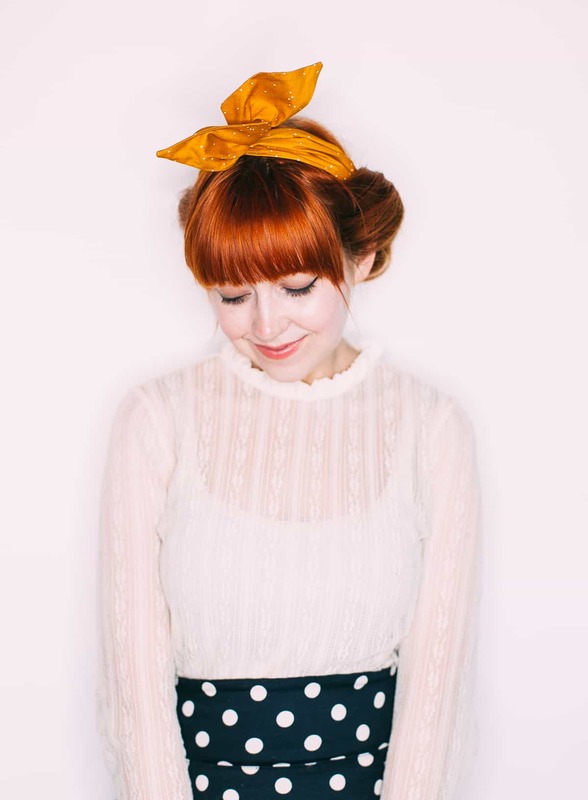 Tie your headband on top (either tied in the front or with a bow lower in the back), and you’re done! I like to think the headband keeps it from looking too juvenile, but since everyone I know is doing this style right now, who really cares if it does look a bit young?! Start by making a couple of small braids in your hair. These will add some texture and interest to the finished style. Then place a headband on top of all of your hair; you might need to use a couple of bobby pins to keep the headband from sliding around! Take small sections of your hair and loop them around your headband. Repeat the loops with your small braids and use a couple of bobby pins to keep the loops from coming undone. You should insert the bobby pins horizontally or parallel to your headband. This style looks nicest when you only use small sections of hair and leave open areas for the headband to peek out. That’s it! Another fun style pulled together with a simple headband that shouldn’t take more than five minutes to do. I used a wire headband for these styles, but you could easily make them with a simple scarf (rolled into a headband) or even a flower crown. Which style is your favorite? Cheers, Rebecca. I love the first picture – I remember when I used to wear headbands all the time back in middle school! Nostalgia! The headband is so versatile, I can’t believe I haven’t worn one in years! I especially loved the tucked look, so cute. That hair-looping style you did second is one of my favourites from when I had longer hair! It was so easy and I got so many compliments on it. Hi! I love this! Where is the headband from? You’re the best, Rebecca! Thank you so much! Going to order one now…. These are all so cute! Drooling always over your gorgeous hair color! I love the post! so cool hairstyles! I can’t put into words how thankful I am that you’ve wrote this post! 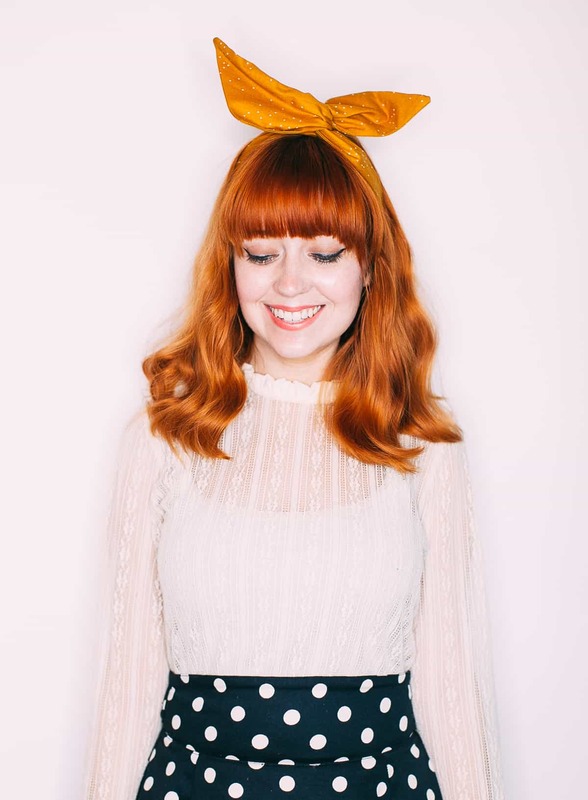 I’ve been wanting to get a headband for ages as I feel like they really can be the perfect accessory – I was only planning on throwing my hair up with it but, now I have so many different styles and varieties to try. In particular, I love the second, third and fifth look – They’re so nice. Wow these are clever, beautiful styles and you have such lovely hair! I will experiment with these next time on date night! I love the second and fifth style, they’re so romantic! The buns are soooo cute! Hi Samantha, I start by putting the hair into pigtails and then I tease them. So basically I backcomb the hair until the pigtails get thick and messy, then I smooth down the top/outer bits and put it into the buns. Teasing can give you a much thicker/bigger look, although it is a pain afterwards! So fun! I miss headbands. Someone told me once that once your Over 40 you can’t wear them anymore so now every time I go to wear one I am super self conscious about it…maybe I will just got for it since I got all this inspo!!! Oh my gosh, Rebecca, you are amazing with hair! I absolutely struggle just to keep mine in a ponytail! Also, your hair looks so cute in pigtail braids. You should totally wear it like that. I love these so much! I tried the milk maid braids yesterday at the pool with my 11 month old son! The perfect mom pool hairstyle! So nice to keep my hair looking great while I splash around with all those crazy kids at the pool! I believe this will be my official hairdo all summer!